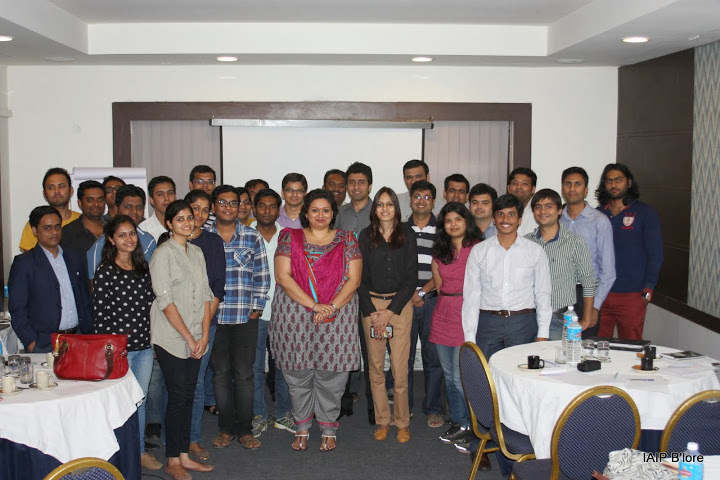 Indian Association of Investment Professionals (IAIP) Bangalore chapter witnessed one of the most enlightening experience sharing sessions on “The Foundations” presented by Sreeja Pillai on October 19th 2013. Sreeja currently heads the talent management department at Payback India, an American Express company. Sreeja shared her personal experience over last 18 years in various capacities and roles as part of this department in companies such as vCustomer and HSBC. The 150 min session was followed by a lively and interactive discussion on the topic. The event concluded with a networking opportunity over lunch. The session focused on fundamental principles necessary for laying a strong foundation to create a successful career. Considering that the Bangalore chapter consists of considerable number of members and candidates in their early stages of career, the participants openly welcomed the thought-provoking discussion. Remain honest: The one time-tested secret to successfully ace an interview is being genuine. A seasoned interviewer would be able to judge whether a candidate is genuine or not. In fact, interviewers today focus on candidates who are open and have an aptitude to learn. Embrace people as they are: Each one of us has our own preferences and unique ways of doing things inculcated during the course of our lifetime. To her, these attributes are hard-wired and seldom change much. It might be a better approach to encourageone in pursuit of his/her interests rather than forcing a change to a particular field. To rephrase – “Every person has a forte and you have to bring that out”. Re-defining perfection: In many situations achieving a 99.9 percent is not sufficient. Certain experiences helped her realize that even a 0.1 percent gap could result in a significant synergistic failure as a team. It is therefore imperative that one aims for absolute perfection. Balance between a leader and a manager: Leadership capabilities are critical for establishing a vision and a direction for the team whereas management capabilities convert the vision into reality. Hence, a balance between these qualities is indispensable to be effective in a corporate environment. Think Creative: Creativity differentiates one from another and is the most crucial quality for a successful leader. The participants were asked to attempt ashort workout. They were asked todivide a square into 4 equal parts. Each one came up with one of the stereotype forms that normally strikes our mind. But, Sreeja showcased some unique shapes of (illustrated below) that can be cut from a square. She thus illustrated how to think out of the box even when one is inside it. Solicit Feedback: Communication, especially in a diverse multi-cultural global environment, is by no standards simple. To her, the biggest obstacle in communication is the distortion of information because of inbuilt filters between the sender and the receiver. To ensure effective communication, one must receive timely feedback from the receiver of information. Be a Commando: Why do we need a commando when we have army, border security force, police etc.? A commando carries special attributes and stays unabated under any kind of adversary. Similarly, every organization needs certain employees who have a commando personality. These employees are creative and more importantly do not fear adopting a path less travelled. Further, a right mix adds to the diversity to the organization. One must have self-driven persistence and passion. Foster Diversity: Diversity in her eyes refers to one’s unique perception, approach, thinking styles and response to a situation. Diversity in an organization nurtures vibrancy, innovation and productivity at workplace. Certain studies classify people in accordance to their thinking and feeling capabilities – associated with the brain and heart respectively. Given below is a table of certain traits based on the more dominant person’s nature. Everyone can be categorized in one category or a combination of certain categories mentioned above. A person who has a perfect balance of all the 4 categories would be considered as the ideal candidate for a senior profile. The team may alternatively hire people accordingly to enhance diversity and thereby synergy. The above mentioned literacy as a whole can be termed as “Emotional Intelligence”. This intelligence today is the single biggest factor on the way to progress and success in a job. Be loyal to what to do as opposed to where you do. This entry was posted in Bengaluru, Career Event, Events and tagged Abhimanyu JL, Bhrigu Shree, CFA, CFA Institute, Deepak Mundra CFA, Hareesh Mothi CFA, IAIP, Indian Association of Investment Professionals, Payback, Sreeja Pillai. Bookmark the permalink.